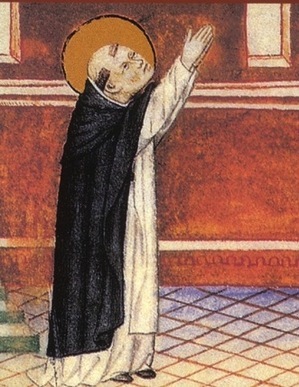 I find this image of Saint Dominic at prayer so expressive of the Deus in adjutorium that I had to use it, even though it does not depict Saint Dominic in the act of choral prayer, but rather in secret prayer. Nonetheless it shows clearly that Saint Dominic’s intimate personal prayer was shaped by the liturgy, and that the embodiment of prayer in gestures accompanied him from the choir to his cell. Saint Benedict orders that the Hours are to begin with the first verse of Psalm 69: Deus, in adjutorium meum intende; Domine, ad adjuvandum me festina. One cannot begin to pray without a special grace of God; “No man can say the Lord Jesus, but by the Holy Ghost” (1 Corinthians 12:3). Prayer begins not in the human heart, but in the Heart of God; it is a divine initiative. When a monk, or a whole monastic choir, send heavenward the immense cry, Domine, ad adjuvandum me festina, one hears in it the urgent plea of every human heart for communion with God, the thirst of millions of souls for living water. I have long had an inner awareness that the Deus in adjutorium calls down the grace of the Holy Ghost in a unique way. Does not the Apostle say that, “the Spirit also helpeth our infirmity. For we know not what we should pray for as we ought; but the Spirit himself asketh for us with unspeakable groanings. And he that searcheth the hearts, knoweth what the Spirit desireth; because he asketh for the saints according to God” (Romans 8:26-27)? The recollected quality or spiritual tenor of an Office is directly proportionate to the attention and devotion brought to bear upon the Deus in adjutorium. An Office well begun will unfold peacefully and in a gentle attention to the presence of God. An Office begun badly, that is to say, in a distracted manner, without having prepared one’s choir books before hand, or in the rush of a last-minute arrival in one’s choir stall, will be troubled from start to finish. This, at least, is my experience. It is always good to arrive in one’s choir stall (or at statio outside of choir) several minutes before the Office is to begin. One’s choir books should be prepared and marked in advance. One needs to take the time to breathe before attempting to chant an Office. The gestures that accompany the Deus in adjutorium are as important as the words. Sacred gestures are the embodiment of prayer: hands folded, with the right thumb crossed over the left, and held with the thumbs at the level of the tip of one’s nose, pointing heavenward like an arrow. Then follows a grand, majestic sign of the cross, made slowly and with gravity. At the doxology, all turn in choir and bow profoundly in adoration of the Most Holy Trinity, rising for the sicut erat in principio. This verse . . . embraces all the feelings which can be implanted in human nature, and can be fitly and satisfactorily adapted to every condition, and all assaults. Since it contains an invocation of God against every danger, it contains humble and pious confession, it contains the watchfulness of anxiety and continual fear, it contains the thought of one’s own weakness, confidence in the answer, and the assurance of a present and ever ready help. For one who is constantly calling on his protector, is certain that He is always at hand. It contains the glow of love and charity, it contains a view of the plots, and a dread of the enemies, from which one, who sees himself day and night hemmed in by them, confesses that he cannot be set free without the aid of his defender. This verse is an impregnable wall for all who are labouring under the attacks of demons, as well as impenetrable coat of mail and a strong shield. It does not suffer those who are in a state of moroseness and anxiety of mind, or depressed by sadness or all kinds of thoughts to despair of saving remedies, as it shows that He, who is invoked, is ever looking on at our struggles and is not far from His suppliants. It warns us whose lot is spiritual success and delight of heart that we ought not to be at all elated or puffed up by our happy condition, which it assures us cannot last without God as our protector, while it implores Him not only always but even speedily to help us. Again, when I have been restored by the Lord’s consolation, and, cheered by His coming, feel myself encompassed as if by countless thousands of angels, so that all of a sudden I can venture to seek the conflict and provoke a battle with those whom a while ago I dreaded worse than death, and whose touch or even approach I felt with a shudder both of mind and body: In order that the vigour of this courage may, by God’s grace, continue in me still longer, I must cry out with all my powers “O God, make speed to save me: O Lord, make haste to help me.” We must then ceaselessly and continuously pour forth the prayer of this verse, in adversity that we may be delivered, in prosperity that we may be preserved and not puffed up. Let the thought of this verse, I tell you, be turned over in your breast without ceasing. Whatever work you are doing, or office you are holding, or journey you are going, do not cease to chant this. When you are going to bed, or eating, and in the last necessities of nature, think on this. This thought in your heart may be to you a saving formula, and not only keep you unharmed by all attacks of devils, but also purify you from all faults and earthly stains, and lead you to that invisible and celestial contemplation, and carry you on to that ineffable glow of prayer, of which so few have any experience. Let sleep come upon you still considering this verse, till having been moulded by the constant use of it, you grow accustomed to repeat it even in your sleep. When you wake let it be the first thing to come into your mind, let it anticipate all your waking thoughts, let it when you rise from your bed send you down on your knees, and thence send you forth to all your work and business, and let it follow you about all day long. This you should think about, according to the Lawgiver’s charge, “at home and walking forth on a journey,” sleeping and waking. This you should write on the threshold and door of your mouth, this you should place on the walls of your house and in the recesses of your heart so that when you fall on your knees in prayer this may be your chant as you kneel, and when you rise up from it to go forth to all the necessary business of life it may be your constant prayer as you stand.